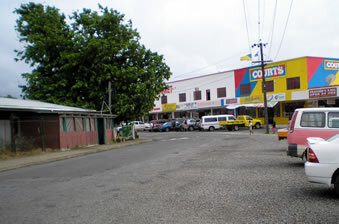 Like all Fijian towns, one of main the focal points is the produce market. Even if you don't intend on buying, you can still wander around, chatting to the locals, and looking at some of the unfamiliar fruit and veges. To tell the truth, not a whole lot! This is a quiet riverside town, where villagers from upriver arrive to sell their produce in the markets. If you have some time to spare, ask one of the punt operators about a trip up the river. It's a great experience, and not to be missed in my opinion. Navua is the starting point of a lot of inland river tours. However, you will generally need to prebook at your hotel or resort activities desk. If organized tours are your idea of fun, then check with the staff at your resort. My personal opinion is you have more fun (and spend less) by exploring yourself. Some of the organized tours seem a little contrived to me. You never actually see the "real Fiji" or the real Fijian people. Instead, what you get is a tourist version. If you really want to experience what life is like for regular Fijian people, my advice is to stay away from organized tours, and go out and explore instead. By bus from the main Suva bus depot. 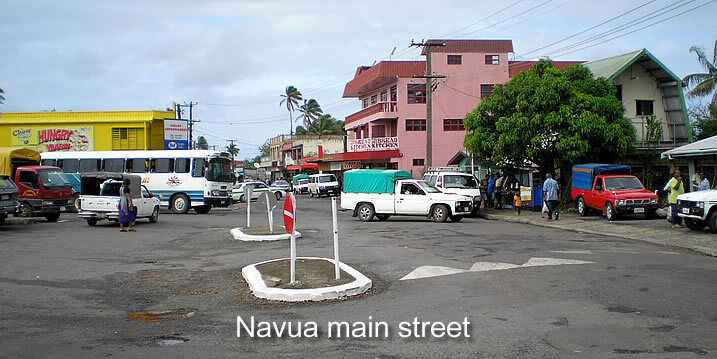 Both the express and local bus service go to Navua. The local bus is cheaper, (around $5) but takes longer to get there. Around one hour. If you are traveling from the other way (coming from the Nadi side) then there are regular buses leaving from Sigatoka. Some of the longboats, or "punts" in the Navua river. Getting ready to depart upriver in one of Navuas "longboat" water taxis. The locals that pilot these boats are incredibly skillful. They know every rapid, every ripple, and navigate their boats up and down the river several times every day. The unusual shade of pink of this building is hard to miss, if you are visiting Navua. Located on the main street, it is opposite the local bus depot. 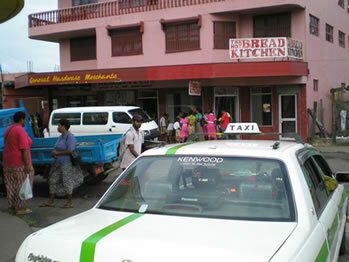 These hot bread shops are everywhere in Fiji. And you can get a loaf of fresh bread, still warm from the oven for under fj$1.